The outreach workers of Priyadarshini Seva Mandali (PSM) identifies the children who come to the Govt Hospital every month for the CD4 test. The outreach workers identify the children who come to the Govt Hospital every month for the CD4 test. These children’s records at the hospital are checked and after speaking to the parents and understanding their socio-econmic background, PSM invites them to shelter home. When they come to PSM center, they are provided with prescribed medicines (not ART medicines) as recommended by the doctor. Usually doctor prescribes medicines for one month. 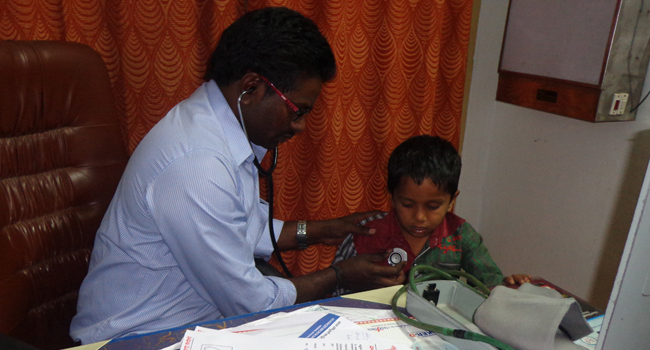 If the child has bigger health issues, PSM supports the medicines upto two months. The costs of medicines usually comes to a maximum of Rs 750. If there is any remainder, PSM purchases food grains/rations necessary for the child. Priyadarshini Seva Mandali (PSM) a Non-Governmental Voluntary organization registered on 27th April 1991 with noble aims and objectives.It has a small dedicated team of staff. PSM is committed to urban & rural development in the all aspects. PSM is a grass root action group working for the development of the under privileged by facilitating the communities to get needed skills and knowledge in the identified areas. The organization is working in Khammam District having its head quarters in Khammam and administration office in Hyderabad. The group believes in facilitating community organization and women empowerment which leads to sustainable development. PSM has been organizing the programs like vocational trainings, in Khammam town, Mid day meals programs for old aged citizens and in total Khammam district, PPTCT center for pregnant women, HIV children nutrition support along with education and medical support. And in Hyderabad, PSM established “A Destitute Senior Citizen Home” in this they are providing food and shelter with total free of cost. The beneficiaries of the care home are orphaned, poor and destitute.